Are you tired of excessive weight gain? Do you want to adapt to an efficient diet plan that makes you lose your weight? Do you wish to master cooking and serve yourself and your loved ones with the most finger licking recipes and quickly? All these questions have a single answer, and we are going to break it down for you effectively. Just turn over a few more pages and change your lifestyle! This book, which is based on Mediterranean Diet for Beginners, is specially devised for people of every physical and medical shape! Our books have changed the course of life for thousands out there, and we will make diet plans guaranteed to provide you with a healthy and nourished lifestyle. Mediterranean Diet is one of the Best Ways to Get Healthy. In this cookbook, we provide you with recipes based on the Mediterranean Diet with the easiest to understand instructions for preparation. We have devised and written this book considering the problems faced by beginners, and this book is going to be your doorway toward a Mediterranean Diet lifestyle with meals for you and your loved ones, ensuring your health and access to a nutritious life. We have provided you with recipes for any time and meal. What does this book offer you? Colorful pictures for each recipe! Get This Cooking Book From Amazon. Ellen Brabson is a nutrition expert and phycologist. 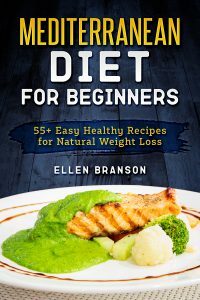 After struggling with her weight throughout half of her life, Ellen decided to study nutrition and wellness. Now she is a mother of 3, health and nutrition consultant, teaching culinary classes and cookbook author. Her passion is to develop delisious and easy recipes, that will still be healthy and healing for the body. Ellen’s passion is to help people reclaim their health, lose weight, feel happy and fulfilled and enjoy their food and cooking process.